Looking for a day trip away from London? Why not head towards the south east coast of England and explore the dramatic white chalk cliffs in Seven Sisters? No, not the 'Seven Sisters' in London but the one located just under 2 hours' drive from London. We did that, and it was just Fabulous! 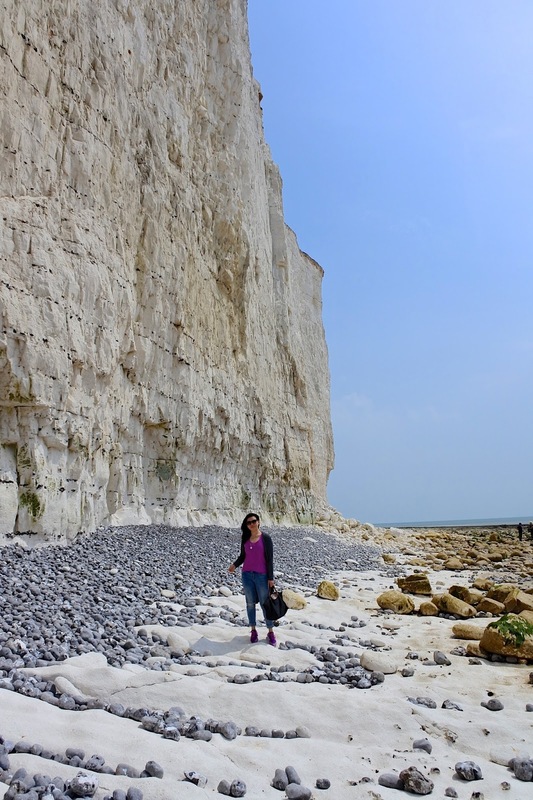 Although easily accessible by train and then buses from Brighton or Eastbourne, we did a road trip from London to Birling Gap & the Seven Sisters and enjoyed some sightseeing along the way. It was the perfect little getaway from London! We were happy to see the sky clearing up as we left London and headed towards East Sussex. A real breath of fresh air kicked in as we drove into the countryside, while the sun was still timidly peaking out of the clouds. The greenery all around us felt amazing and when I saw a chalk figure of a horse on a hill side, Oh! I got so excited!! I immediately urged hubby to stop the car so I could take some shots! I love these kind of unexpected discoveries along the way! Once hubby stopped the car safely (we were on a very narrow little road), I managed to take this shot. It was still a bit far but I'm so pleased to have seen it! After a little research on Google, we find that it is called the Litlington White Horse in East Sussex. We soon arrived to Birling Gap & the Seven Sisters, which is the best place to view the dramatic white chalk cliffs. The skies had cleared up by then and we had a very clear day ahead of us! It was beautiful! Only a few meters walk from the car park and this was what I have been waiting for! The first sight of a breathtaking view of the white chalk cliffs. These are the steps taking you down to the 'beach' area when the tide is low. Pebble beach at the Birling Gap & The Seven Sisters. What a glorious day! I could not believe I was finally there! I have been wanting to come here for I cannot remember how long and it seemed pretty unreal! Dried seaweed. Fresh from the sea! :p Yummmm!!! Hehehe just kidding! Majestic white cliffs compared to little me walking along the shore. 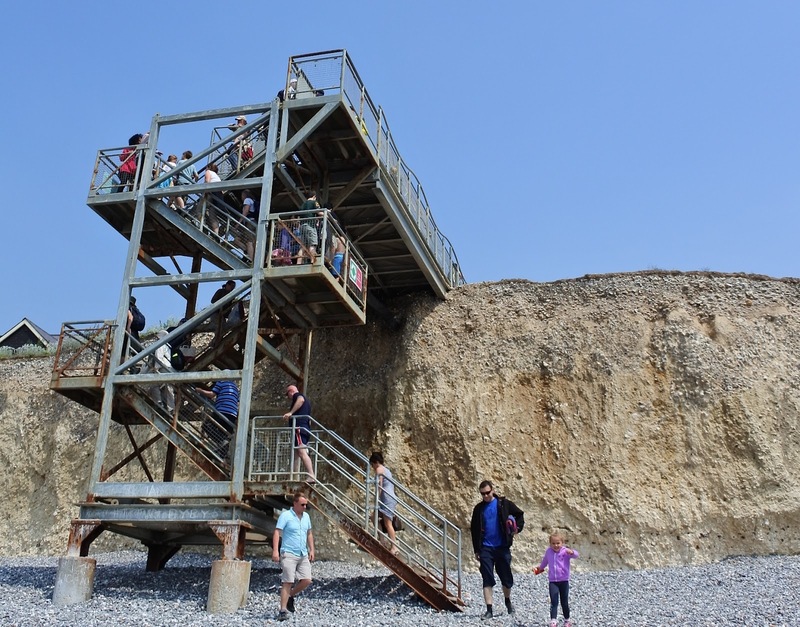 Located only a few minutes drive down the coastal road from Birling Gap & the Seven Sisters, this stop is for the nature lovers looking to do some footing whilst enjoying the view of the cliffs from above. From here, you can also spot the pretty stripy red and white lighthouse making the cliffs look even more picturesque! We then decided to take a walk down the slopes towards the beach, where we could see Eastbourne from afar and also the pier. It is quite a steep slope to walk down so comfy shoes are recommended, as well as good knees! We caught a different view of the lighthouse from the other side of the cliffs. This is the closest we got the the beach. Can you see the Eastbourne Pier? After a good hour of walking and 'climbing up' the slope to get back to the car park, we were satisfied with the amount of calories burnt and were happy to call it a day! We drove towards the coastal road of Eastbourne to check out the Town Centre before taking the road again and heading back to London. Now that summer is finally here, I'm hoping to plan many more road trips as such around England. EverydayShirl ♥ copyright 2015. Powered by Blogger. Copyright ♥ 2016 Everyday Shirl All rights reserved.